Note: The ball cups for these are the smaller cups for the nitro Savage and will not work with the flux and 2350 as both of the electric savages have larger dogbones. 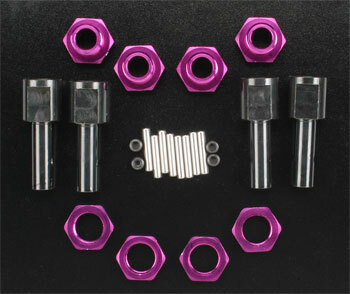 From HPI Racing comes the 17mm Hex Hub Conversion Set for the Savage. Bolting on this easy upgrade allows Savage truck owners to use 17mm hex hub wheels like our #4925 Nubz wheels. 17mm hex hubs decreases the stress on the wheels, helping to prevent stripped wheels when using high horsepower engines. Strong steel axles are used for durability, machined lightweight aluminium hubs and wheel nuts are used for quick acceleration and anodized purple for a custom look. One set comes complete with everything needed to upgrade a Savage truck, including four axles/nuts, a wrench, thread lock and grease.